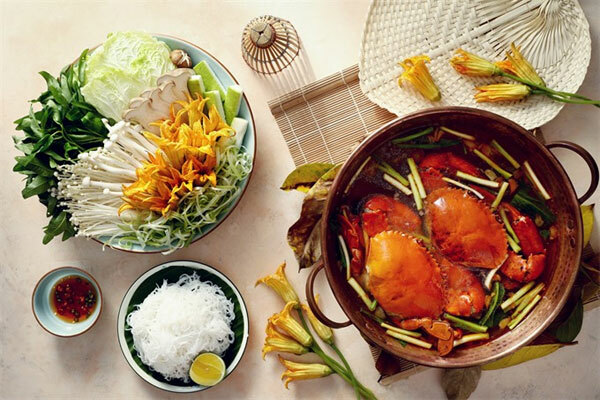 VietNamNet Bridge – Vietnam has a rich variety of hotpots from seafood and chicken to beef, but among them lẩu cua bầu (sea crab with squash hotpot) is a favourite of Hanoians when winter comes. Ngon Garden, a newly opened restaurant of Quan An Ngon restaurant chain, in one of Hanoi’s most beautiful streets of Nguyen Du, offers such hotpots. Last week, I arrived at the restaurant in a group of eight in front of the peaceful Thien Quang Lake. Around the restaurant are gardens of tropical plants like cay thi (gold apple) and jackfruit trees, giving it a beautiful ambience. I was particularly impressed by the small lakes with different kinds of ornamental fish swimming under purple lilies. A waiter led us to a villa room with a view onto Thien Quang Lake and adorned with a large table, a yellow rose pot and beautiful paintings by the likes of Tran Van Can and To Ngoc Van. Dig in: A tray of lau cua bau ready to serve. Soon after we sat down, a waiter brought us dishes such as salad, Nha Trang grilled beef with black pepper, catfish with fermented rice and galangal, dried squid and several other dishes. The dishes were enjoyable but all of us agreed that the lau cua bau we ordered was the biggest hit for its tasty and aromatic flavour. The restaurant’s in-house culinary expert, Le Kim Chi, said ingredients from the dish include sea crab, sa sung (peanut worms), bao ngu (abalone), hai sam (sea cucumber), so diep (scallops) and white clams. Other ingredients include water morning glory, Malabar spinach, oyster mushroom, pumpkin buds’ flowers and a kind of squash. “Different from similar hotpots, our dish is frugal but rich with nutrition,” said Chi. 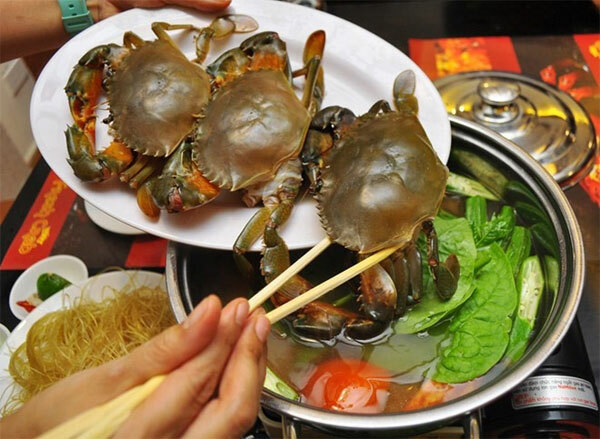 Hard exterior, delicious interior: Sea crabs, the main ingredient for lau cua bau. Several of our group said this meal allowed them to eat more vegetables than they normally would, as the veggies were rich with the taste from the sea crab and the other ingredients in the hotpot. The fresh sea crab was crispy and sweet while the squash pieces were soft and fragrant. The dish was a delight, with a pure broth, sweet and hot, as was the soft squash. Each of us ate two bowls of broth and my young friend next to me enjoyed pouring the broth into a bowl of noodles. “Despite being full I can eat more without being satiated because it helps me feel warmer, stronger and more comfortable,” he said. Chi said sea crab is rich with calcium, magnesium, protein, kali, zinc, bronze and omega 3, making it very good for cardiovascular system. She told us that to cook a similar hotpot at the Ngon Garden Restaurant we should buy cua gach (eggs bearing crab) because apart from being rich meat, the eggs create a colourful sauce. The dish was so delicious that I told Chi to give us a recipe to cook it at home. 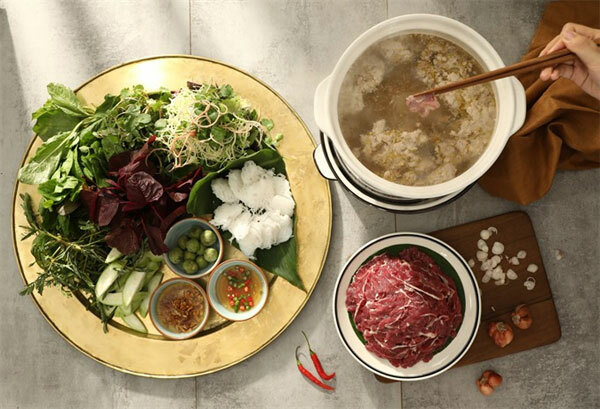 Ngon Garden has more than 300 different kind of dishes from Việt Nam’s three regions and is the ideal place for anyone, local or foreign to discover the rich Vietnamese cuisine. Apart from experiencing food, Ngon Garden is also a calm place for doing work or simply enjoying a coffee or tea. Comments: Fresh and quality dishes with very comfortable seats and beautiful landscape in and around the restaurant.